That’s too bad, because I add new features (and fix issues) all the time. But updating is a tedious, manual process. We are working at Reclaim Hosting for an approach to make installs one click apps, and updates done too, but that’s still in development. But I have a new approach I’ve been experimenting with, share via email by Troy Welch at TRU. It’s a plugin called WP Pusher that is very promising because it offers a direct install (without downloading/uploading) AND a Push-to-Deploy way to link it so that when I push updates to the theme, your site will automatically update its copy of the theme. I’ve experimented on a few sites, and it works as advertised. It will require that you have/create a github account, and that you download and install the WP Pusher plugin. For a first test, I’ve updated the install instructions on the TRU Writer SPLOT to include instructions for using this plugin. 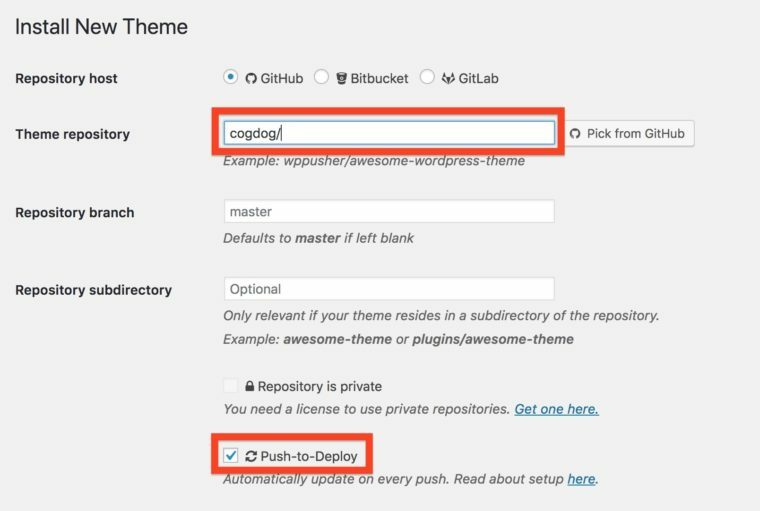 Once setup, it’s a matter of entering the name of the repository, in this case cogdog/truwriter, and selecting the Push to Deploy option (if you do not want it automated, you can update via a link click when you want a new version). Not really a catch. This will work great on new installs. But what if you have an existing slot site? Well here is a small rub.. There is an option in the plugin to update an existing theme, but it only works if the name of the directory where it is installed inside your WordPress wp-content/themes directory matches the name of the repo. When I create sites, I usually upload the themes via ftp. But if you downloaded the theme from github, it will come in a file named something like truwriter-master.zip which means, if that zip is uploaded to your site, the theme will exist in a directory named truwriter. 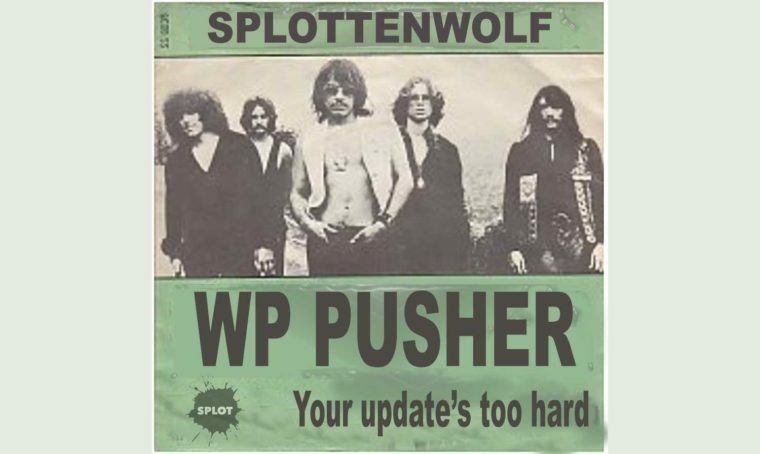 And WP Pusher will fail to update. Changing the name of theme directories is fraught with peril. Troy has listed a way, but you end up doing search and replace in your MySQL database which means, if not already, I have lost you. If you install a new version via WP Pusher, you could switch themes, and delete your older one, but you will have to recreate all settings. Messy. I am hoping for a better answer, from someone else! But besides that, for new installs, I suggest taking this route- getting automatic updates directly from github will save you a lot of manual effort, or missing out of new features. Featured Image: My own remix of a single cover for Steppenwolf’s “The Pusher” done for my amusement, parody, non-commercial use, and technically, likely illegal. Sometimes, in the name of art, you gotta bend the rules.